La noruega, coming to you from Norway! Everything seems clean and quiet and green… I was allowed one day of nice weather before it started raining this morning, and it hasn’t stopped yet. Charming! But luckily tomorrow is supposed to be better. So what is the first thing I did, after saying hi to friends and family? Go to IKEA, of course! I know it is Swedish but it really is like the mother ship to me. 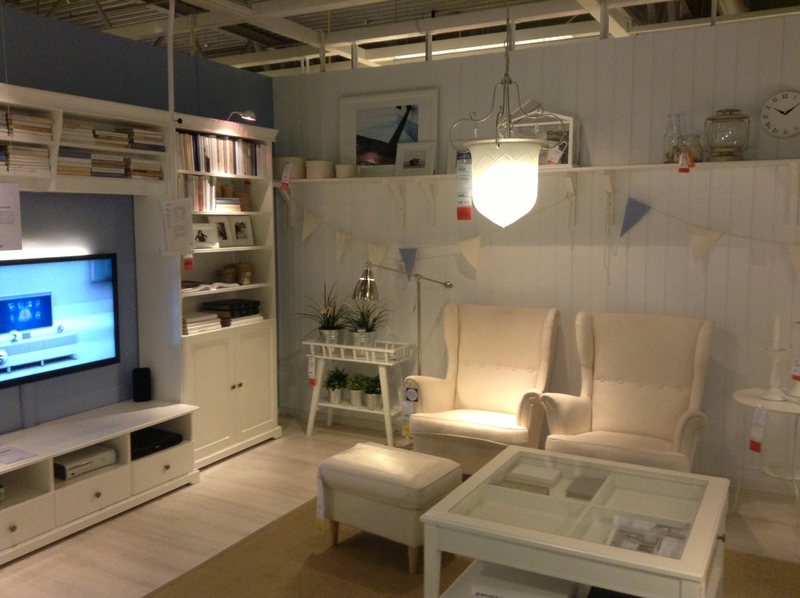 Letting all Scandinavians have identical furniture even when outside of Scandinavia! Argentina really, really needs IKEA but with the import restrictions there is no way it will happen. Buuuh! I even took a photo at IKEA! Gotta bring back some inspiration to Argentina. (Along with a bag stuffed with products. I will even bring a lamp, since it is so neatly packed.) I will do other things as well, though, especially trying to get back into shape after the food fest that has been Argentina. Little sister got me in boot camp! Will try to avoid red meat for this month, after having eaten more red meat in nine months than in the previous nine years. This entry was posted in Argentina en Noruega, Argentina i Norge, La noruega en Noruega, Norsk i Argentina, Norway in Argentina. Bookmark the permalink. I love Ikea, too. Great photo for inspiration! Enjoy your visit home. Ja, er den ikke fin?? Heldige deg som har IKEA der du bor, tror det er noe av det jeg savner mest! eso es adentro de IKEA?